The name of the ability a. An initiative number b. The initiative number of the leading card played determines a player's order in the initiative of a given round. The level of the class card c. A character starting at Level 1 can only use their Level 1 cards (or, alternately, cards), but a character gains more powerful cards as they level up to add to their pool of available ability cards. A top action d and bottom action e. When the two ability cards are played on a player's turn, one is used for the top action and the other for the bottom action. Note that a single action can contain several separate abilities f.
Item cards are acquired by spending gold in between scenarios or looting specific treasure tiles. All item cards a character equips will be placed below his or her character mat and can be used during a battle to augment his or her abilities. Item cards are not class-specific, so any character can use any item. However, characters are limited in the number of items they can equip (bring into a scenario). Each character can equip only one head item, one body item, one leg item, up to two hand items OR one two hands item, and up to a number of small item equal to half their level, rounded up. Characters cannot own more than one copy of any item card. The name of the item a and the amount of gold a character must pay to acquire the item from the shop b. What happens to the card after it is used c.
This symbol means the item is spent after use, which is denoted by rotating the card to its side. Spent cards can be refreshed when a character performs a long rest. Sometimes an item is used multiple times before it is spent or consumed. This is depicted by use slots d on the card and can be tracked using a character token. This symbol (not pictured) means the item is consumed after use, which is shown by flipping the card facedown. Consumed cards can only be refreshed during a scenario by specific abilities. All items are refreshed between scenarios. No item can be permanently consumed. If a card depicts neither of these symbols, there are no restrictions on the number of times it can be used during a scenario, other than what is written in the text of the card. When the item can be used and the bonus gained by the character when the item card is used e.
The equip slot (Head, Body, Legs, One Hand, Two Hands, Small Item) the item occupies f.
Some equipped items add a number of cards to the equipping character's attack modifier deck at the start of a scenario. If this is the case, the number of modifier cards is specified on the item g.
A count of how many of this item are in the game h and where this card lies within that count i. Reference number for the item j, which is on the back of the card. Monster statistic cards give easy access to the base statistics of a given monster type for both its normal and elite variants. A monster's base statistics will vary depending on the scenario level. Each edge of the cards, on both sides, reflects the statistics for a given scenario level. Rotate or flip the card to show the required level. The monster's name a and level of the statistic set b corresponding to the scenario level. Sections for normalc and elite d versions of this monster. A monster's hit point value e, which is the amount of damage that needs to be inflicted on the monster before it dies. A monster's movement value f, the base number of hexes a monster can move with a Move action. A monster's attack value g, the base amount of damage the monster does with an Attack action. A monster's range value h, which is the base number of hexes away from the monster's own hex that the monster can reach with an attack or a heal. A "-" as the range value signifies the monster's normal Attack action can only target adjacent hexes (i.e., a melee attack). Any special traits this monster type possesses i. These traits are permanent and persist from round to round. These traits may include Flying, which is symbolized by j next to the monster's name. 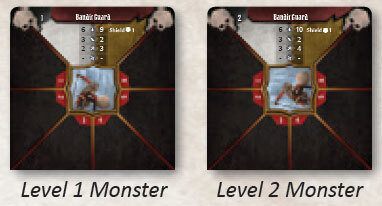 Each round, after players have selected their own ability cards, one card is played for each monster type currently on the board from their respective decks of monster ability cards. These cards determine which abilities each monster of that type-both normal and elite-will perform during the round on its turn. The name of the monster type a. Sometimes, multiple monster types use the same, more generic ability deck. For instance, Bandit Guards, City Guards, and Inox Guards all use the same "Guard" deck. An initiative number b. This number will determine when every monster of that type will act in a given round. A list of abilities c. A monster will perform each of these abilities in the order listed (if possible) and then end its turn. A shuffle symbol d. If this symbol appears on a card, shuffle the corresponding monster's ability discard pile back into the draw deck at the end of the round. At the beginning of every scenario, each character receives two battle goal cards in secret and chooses one to keep, discarding the other. If the scenario is successfully completed and the character meets the criteria of the chosen card a, he or she will earn a number of checkmarks as specified on the bottom of the card b.
Checkmarks are used to enhance a player's attack modifier deck. If the scenario resulted in failure, the character receives nothing from his or her battle goal card, regardless of whether the goal was achieved. Players can keep track of their battle goal progress using notes if necessary. Players should keep their battle goals secret from one another until the scenario is over. 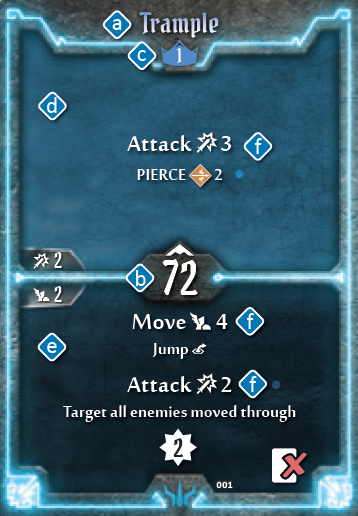 Any time an Attack ability is performed, a separate attack modifier card is drawn for each individual target of the attack. Players draw from the personal attack modifier deck for their chosen character and monsters draw from a collective monster deck. 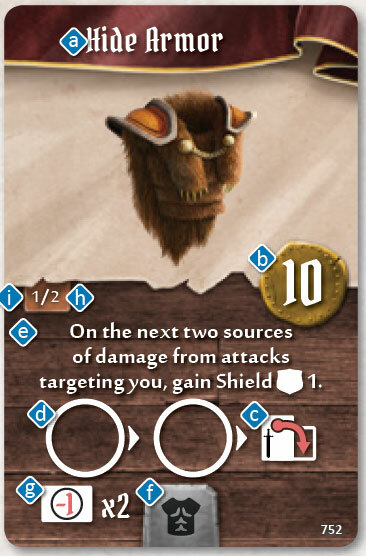 The modifier listed on the card is then applied to the attack, possibly reducing or increasing its numerical value. The value of the modifier for the attack a. A "Null" symbol b means that no damage is done by the attack. 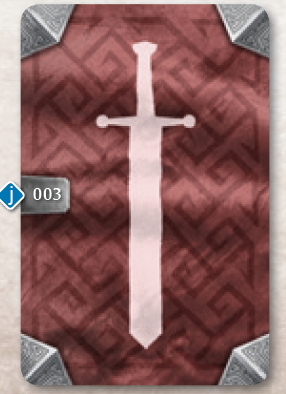 A "2x" symbol c means the attack value is doubled. Conditions, elemental infusions, or other special effects of the attack d. If the attack modifier of the card is +0, the special effect is shown in the center circle of the card e. Otherwise, it is shown to the left of the modifier value f. When these special effects are activated, they function exactly as if they had been written on the action card being used for the attack. A rolling modifier symbol g indicates that an additional modifier card should be drawn. 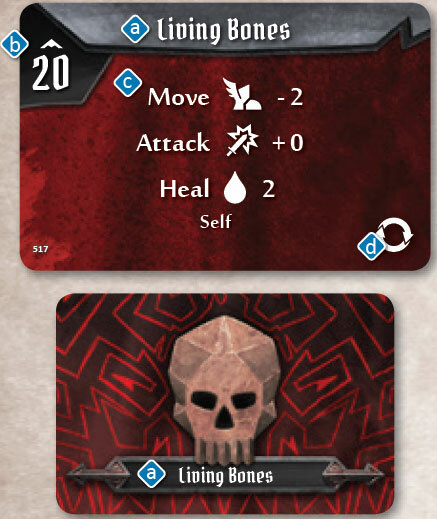 Modifier cards are then drawn until a rolling modifier is not revealed, at which point all the drawn modifiers are added together. A shuffle symbol j. At the end of the round in which a "Null" or "2x" card is drawn from a deck, players will shuffle all the played modifier cards back into that particular draw deck. 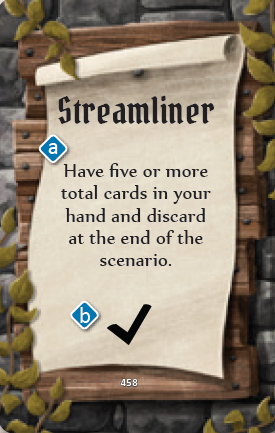 This shuffling also happens if a modifier card must be drawn and there are none left in the draw pile. Add "push 2" and the earth element effects to your attack, then increase y = our attack value by 2. A type icon k. All standard attack modifier decks have a 1, 2, 3, 4, or M icon l for easy sorting, such that all cards with a given icon form the standard 20-card deck. All cards a character class adds to their modifier decks through perks have the symbol of that character class m. cards added to a modifier deck by a scenario or item effect have a icon n. These cards should be removed at the end of a scenario.